Observation of many images of creatures and natural materials taken with transmission electron microscopes reveal structures and patterns reminiscent of symbols and representations used in traditional Aboriginal and Torres Straight Islander art. This visual similarity forms the basis of Connections, a program established by the Australian Micoscopy and Microanalys Facility to engage young Aboriginal and Torres Straight Islanders with Western science. This unique art project based on Indigenous art works inspired by images from electron microscopes is now underway and will be launched in June 2018. By working with Elders and Indigenous artists, Connections is creating a touring exhibition of micrographs and associated artworks that can be used as a basis for STEM engagement activities around Australia. With invited participants creating new artwork specifically for this project, the exhibition is anticipated to provide youngsters and their families with a new connection to modern science and encouragement for their engagement with, and pursuit of, science and higher education for the benefit of themselves, their communities and all Australians. Connections also seeks to engage the wider community with science and microscopy through wonderful imagery that has the potential to promote STEM educational pathways. 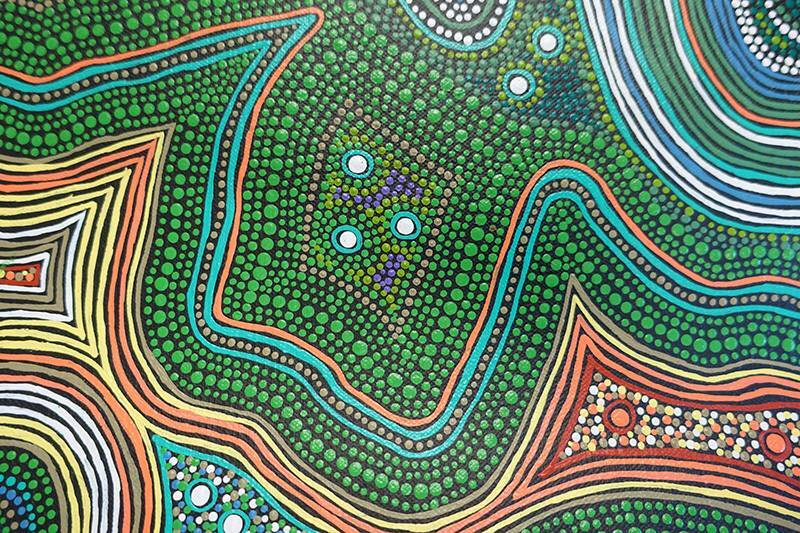 In many cases, the micrographs provided as inspiration are very affirming for the artists involved and show a powerful Aboriginal view of the world hidden in the land and living things. The micrographs and artworks will be displayd side by side to demonstrate connections between Indigenous story-telling and Western scientific imaging. Indigenous artists and art centres have been excited to have new ideas to explore, as well as having new opportunities to share their work in the new context of promoting STEM education. There has been widespread support in Indigenous communities for the project’s educational aims. Find out more about Connections by following the Facebook page. Image shows part of Arkeria Rose Armstrong’s beautifully detailed work that tells the story of a crocodile and how opal was formed. Guest post by Dr Jenny Whiting, Marketing & Business Development Manager at the Australian Centre for Microscopy & Microanalysis.